Rosalvo (pronounced HosARvo) is a farmer who grows and then sells fruit and vegetables door-to-door from the back of his donkey named Medalha. He is a “vendedor ambulante”, literally a mobile, walking shop. Seven days a week he leaves his smallholding at around 7am with Medalha laden with coconuts, aipims, cashew fruits, roasted cashew nuts, lemons and bananas (the produce varies with the seasons), for a one hour ride to reach his first cliente (customer) in Mar Grande. We met Rosalvo through our interpreter, Wilma, who is also one of his clientes. Her gardener’s mother lives near Rosalvo’s mother so Wilma was able to cycle up to the mother’s house and leave a note asking for Rosalvo to visit her house to discuss the project with us. We arranged to joined him for a four hours one Saturday morning to photograph his clientes, walking his regular route, winding through the dusty roads on the outskirts of the town to the beach front houses and the town centre. During this time he took about R$60 (17 UK pounds). Our day with Rosalvo was extremely hot, and whilst we and Medalha drank a few litres of water, Rosalvo drank none. When we mentioned this later, someone said some Brazilian men are made of leather. Even later, Luis at Sacatar recounted a childhood memory of a similar enterprise in his aunt’s home town, Vitoria da Conquista, Bahia. 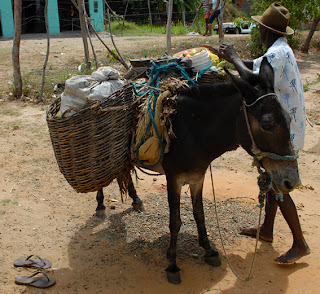 Using donkeys’ ability to be trained to remember a route, the farmer’s donkey, straddled with two churns of freshly drawn milk would walk the route on its own, stopping at pre-arranged places where clientes would take what they needed and honour the farmer and pay in person at the end of each month.